From left, Josh Wyner, executive director of the Aspen Institute’s College Excellence Program, leads a discussion with Lenore Rodicio, Sandy Shugart and Jean Desravines. WASHINGTON — This past Friday, national leaders, including Dr. Walter Bumphus of the American Association of Community Colleges, joined officials with the Aspen Institute and the Achieving the Dream organization to urge major improvements in how two-year college presidents are recruited, prepared, hired and evaluated. Bumphus and others participated in “The Community College Presidency” forum event and release of Crisis and Opportunity: Aligning the Community College Presidency with Student Success, a report by the Aspen College Excellence Program and Achieving the Dream, Inc. The report “addresses how the next generation of community college leaders can improve success for nearly half of America’s college students in an era of rapid change,” according to officials. “[AACC has] found that 43 percent of the current presidents are slated to retire in the next five years. We couple that with another 32 percent that are scheduled to retire in 10 years,” Bumphus, the American Association of Community Colleges (AACC) president and CEO, told forum participants in an effort to describe the enormity of the community college leadership challenges. “That’s 75 percent of our nation’s [community college] leaders expected to turn over,” he said. Relating his own experiences as a former community college president, Bumphus emphasized the ongoing need for leadership training for up-and-coming leaders at two-year institutions. “As I stated during the AACC conference [in April] … we had 146 new presidents named between April 2012 and April 2013. That’s significant because that’s [more than] 10 percent of the community college presidents in the country,” Bumphus said. “We’ve had 31 new presidents named since AACC. … That really points out the need to have leadership development” beyond the existing programs, he noted. National community college leaders attended last week’s report release and forum in an effort to highlight the importance of and to bring attention to the Crisis and Opportunity report. With funding from the Kresge Foundation, officials with the Aspen College Excellence Program and Achieving the Dream had worked on the report for a year prior to its release last week. 1) They educate more than 7 million degree-seeking students, more than 40 percent of the U.S. college population. 2) They have, in recent years, been growing at four times the rate of four-year colleges. 3) They enroll a disproportionately large share of the rapidly expanding number of college students of color and first-generation students. Based on assumptions that expectations will increase for two-year institution leaders, the report cites significant gaps in the way community college presidents are prepared and the criteria used by trustees to hire them. The report also highlights the need for leaders who can address emerging challenges, such as reforming developmental education, using technology successfully and building diverse communities that foster inquiry and action throughout institutions. “We have a confluence of conflicting forces of declining resources amidst growing expectations and an economy that’s shifting rapidly, as well. [There’s] a demographic revolution of students becoming much more diverse,” Northern Virginia Community College president Robert Templin said during “The Community College Presidency” forum panel discussion. “When you put it together, the challenge … is that the requirements that leaders face today are finding ways to serve a greater number of more diverse students with significantly better outcomes … at a declining cost per student. Those are the realities that we face,” he added. As an educational and policy studies organization based in Washington, the Aspen Institute began its College Excellence Program to help “identify and replicate practices, policies and leadership that significantly improve college student outcomes,” according to the institute. 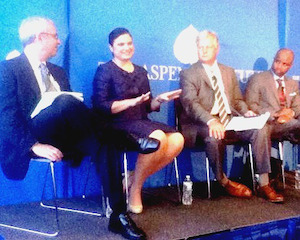 “We agree with Aspen that leadership in community colleges issue is both urgent and critical. And we’re particularly interested in this because we see that it’s essential we support community college leaders as they drive a national reform movement,” said Carol Lincoln, senior vice president of Achieving the Dream, Inc. Achieving the Dream, Inc. is a national nonprofit leading one of the nation’s largest community college reform network for student success. 4) Additional opportunities should be created for highly effective presidents to teach aspiring leaders strategies for improving student success and managing change. While experienced presidents already serve as instructors in many education and training programs, including those administered by AACC and the League for Innovation, students would benefit from even more hands-on engagement with those who have successfully advanced student access and success in the rapidly changing environments in which community colleges operate.